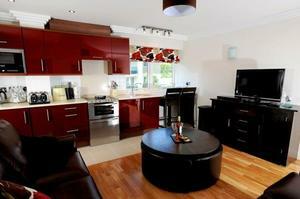 Living Contemporary style open plan living, dining and kitchen area with solid oak furniture throughout. Living area furnished with a pair of matching leather settees, an adjustable height coffee table enabling dining for 4, sideboard and mirror. 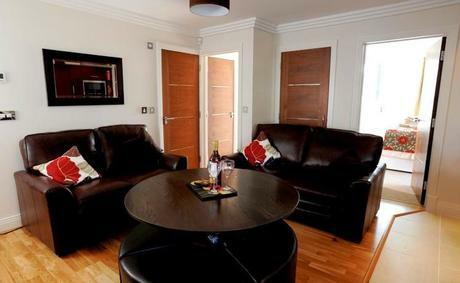 Features a flat screen TV with Freeview and blueray. Sleeping - Bedroom one Furnished with a kingsize bed, dressing table with matching chair and a mirror, with patio doors leading out onto the large balcony with sea views Bedroom two Furnished with bunk beds & pull out trundle bed sleeping three, with patio doors leading out onto the large balcony with sea views. Kitchen Stylish modern kitchen including integrated appliances including an electric oven and hob . Full range of utensils and accessories including a microwave, kettle, toaster and electric grill. The dining area comprises of a breakfast bar with two matching high chairs. On-site laundry facilities are available free of charge, 24 hours a day. 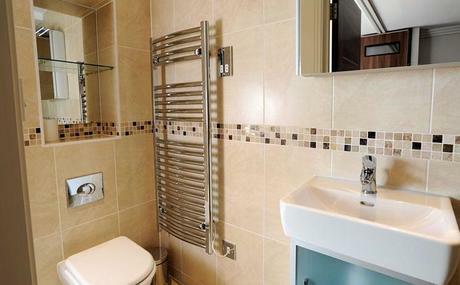 Bathroom The bathroom comprises of a shower cubicle, wc, wash basin, shelving, mirror and heated towel rail. 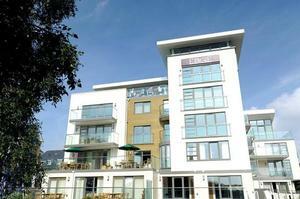 Outside Large balcony offering sea views and furnished with a patio table and matching chairs. Allocated parking for one car. Lift access to the 1st floor and concierge. 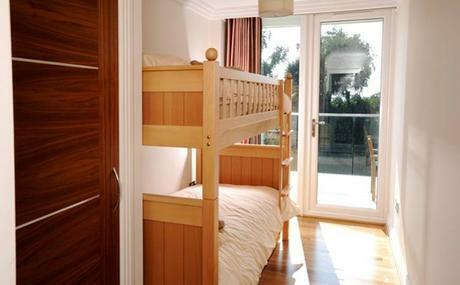 Just a 10 minute walk to Bournemouth town centre and beaches are less than a mile away. 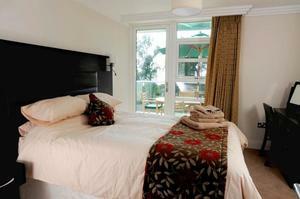 Within short driving distance are New Forest National Park and Jurassic Coast.